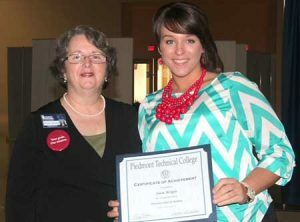 Piedmont Technical College student and Edgefield resident Stacie Morgan (right) was recently awarded the Honeycutt Scholarship. Morgan, an associate degree nursing student, is congratulated by Brenda Brooks, scholarship committee member. The scholarship is awarded annually to an Edgefield County student and is based on academic achievement and financial need.